A buffer solution (more precisely, pH buffer or hydrogen ion buffer) is an aqueous solution consisting of a mixture of a weak acid and its conjugate base, or vice versa. Its pH changes very little when a small amount of strong acid or base is added to it. Buffer solutions are used as a means of keeping pH at a nearly constant value in a wide variety of chemical applications. In nature, there are many systems that use buffering for pH regulation. For example, the bicarbonate buffering system is used to regulate the pH of blood. Simulated titration of an acidified solution of a weak acid (pKa = 4.7) with alkali. 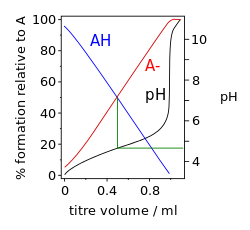 Buffer solutions achieve their resistance to pH change because of the presence of an equilibrium between the acid HA and its conjugate base A−. and only a little is consumed in the neutralization reaction which results in an increase in pH. Once the acid is more than 95% deprotonated the pH rises rapidly because most of the added alkali is consumed in the neutralization reaction. Buffer capacity, β, is a quantitative measure of the resistance of a buffer solution to pH change on addition of hydroxide ions. It can be defined as follows. where CA is the analytical concentration of the acid. pH is defined as −log10[H+]. This equation shows that there are three regions of raised buffer capacity. At very low p[H+] the [H+] term in the denominator predominates and buffer capacity rises exponentially with decreasing pH. The buffer capacity of a buffering agent is at a local maximum when p[H+] = pKa. It falls to 33% of the maximum value at p[H+] = pKa ± 1 and to 10% at p[H+] = pKa ± 1.5. For this reason the useful range is approximately pKa ± 1. Buffer capacity is proportional to the concentration of the buffering agent, CA, so dilute solutions have little buffer capacity. At very high p[H+] the second term in the denominator is effectively constant and buffer capacity rises exponentially with increasing pH because of the [H+] term in the numerator; [H+]=10−pH. Properties 1 and 3 are independent of the presence or absence of added buffering agents. They are concentration effects and reflect the fact that pH is related to the logarithm of the hydrogen ion concentration. 3) is present in blood plasma, maintaining a pH between 7.35 and 7.45. The majority of biological samples that are used in research are made in buffers, especially phosphate buffered saline (PBS) at pH 7.4. For buffers in acid regions, the pH may be adjusted to a desired value by adding a strong acid such as hydrochloric acid to the particular buffering agent. For alkaline buffers, a strong base such as sodium hydroxide may be added. Alternatively, a buffer mixture can be made from a mixture of an acid and its conjugate base. For example, an acetate buffer can be made from a mixture of acetic acid and sodium acetate. Similarly an alkaline buffer can be made from a mixture of the base and its conjugate acid. By combining substances with pKa values differing by only two or less and adjusting the pH, a wide range of buffers can be obtained. Citric acid is a useful component of a buffer mixture because it has three pKa values, separated by less than two. The buffer range can be extended by adding other buffering agents. The following mixtures (McIlvaine's buffer solutions) have a buffer range of pH 3 to 8. A mixture containing citric acid, monopotassium phosphate, boric acid, and diethyl barbituric acid can be made to cover the pH range 2.6 to 12. Other universal buffers are the Carmody buffer and the Britton–Robinson buffer, developed in 1931. For effective range see Buffer capacity, above. (*) Tris is a base, the pKa of 8.07 refers to its conjugate acid. First write down the equilibrium expression. This shows that when the acid dissociates equal amounts of hydrogen ion and anion are produced. The equilibrium concentrations of these three components can be calculated in an ICE table. The first row, labelled I, lists the initial conditions: the concentration of acid is C0, initially undissociated, so the concentrations of A− and H+ would be zero; y is the initial concentration of added strong acid, such as hydrochloric acid. If strong alkali, such as sodium hydroxide, is added y will have a negative sign because alkali removes hydrogen ions from the solution. The second row, labelled C for change, specifies the changes that occur when the acid dissociates. The acid concentration decreases by an amount −x and the concentrations of A− and H+ both increase by an amount +x. This follows from the equilibrium expression. The third row, labelled E for equilibrium concentrations, adds together the first two rows and shows the concentrations at equilibrium. With specific values for C0, Ka and y this equation can be solved for x. Assuming that pH = −log10[H+] the pH can be calculated as pH = −log10(x + y). % species formation calculated for a 10 millimolar solution of citric acid. Polyprotic acids are acids that can lose more than one proton. The constant for dissociation of the first proton may be denoted as Ka1 and the constants for dissociation of successive protons as Ka2, etc. Citric acid, H3A, is an example of a polyprotic acid as it can lose three protons. When the difference between successive pKa values is less than about three there is overlap between the pH range of existence of the species in equilibrium. The smaller the difference, the more the overlap. In the case of citric acid, the overlap is extensive and solutions of citric acid are buffered over the whole range of pH 2.5 to 7.5. Kw is the constant for self-ionization of water. There are two non-linear simultaneous equations in two unknown quantities [A3−] and [H+]. Many computer programs are available to do this calculation. The speciation diagram for citric acid was produced with the program HySS. ^ Butler, J. N. (1964). Ionic Equilibrium: A Mathematical Approach. Addison-Wesley. p. 151. ^ a b Hulanicki, A. (1987). Reactions of acids and bases in analytical chemistry. Translated by Masson, Mary R. Horwood. ISBN 978-0-85312-330-9. ^ Scorpio, R. (2000). Fundamentals of Acids, Bases, Buffers & Their Application to Biochemical Systems. ISBN 978-0-7872-7374-3. ^ McIlvaine, T. C. (1921). "A buffer solution for colorimetric comparaison" (PDF). J. Biol. Chem. 49 (1): 183–186. Archived (PDF) from the original on 2015-02-26. ^ Mendham, J.; Denny, R. C.; Barnes, J. D.; Thomas, M. (2000). "Appendix 5". Vogel's textbook of quantitative chemical analysis (5th ed.). Harlow: Pearson Education. ISBN 978-0-582-22628-9. ^ "Buffer Reference Center". Sigma-Aldrich. Archived from the original on 2009-04-17. Retrieved 2009-04-17. ^ Alderighi, L.; Gans, P.; Ienco, A.; Peters, D.; Sabatini, A.; Vacca, A. (1999). "Hyperquad simulation and speciation (HySS): a utility program for the investigation of equilibria involving soluble and partially soluble species". Coordination Chemistry Reviews. 184 (1): 311–318. doi:10.1016/S0010-8545(98)00260-4. Archived from the original on 2007-07-04.